I once put together a bookcase with a shoe and a screwdriver. I was young, impulsive, and it was too late to go to the store to get a hammer. I was tired of looking at the unassembled bookcase in the middle of my living room, so I looked around the apartment to see what was available. What I came up with was a shoe. I pounded away at those nails for quite some time, but eventually, it got the job done. The nails were all hammered in, and I was able to put books on it. It held together for a while, until months later when I tried to move it. Because shoes are great, they protect your feet from the elements. It’s a matter of finding the right tool for the job and using it. When it comes to your business, it’s a lot more nuanced. What you need isn’t always obvious, and grabbing whatever is nearby to get the job done might seem awfully tempting. There are times where you need someone suited for charging up that hill and Macgyvering a solution. There are also positions where you need someone who is going to follow instructions down to the last detail. You can grab a shoe to do the task, and while it might be “good enough” for a time, in the long run, if you want it to last, you are going to need that hammer. For all of the analogies, people aren’t tools used to get the job done. They are wonderfully complex individuals with rich experiences and often colorful personalities. If you could just look at a resume, or sit down and have a conversation with someone, and determine how those factors were going to interact in the long run with the existing structure of your organization, that would be fantastic! It is a key to help you unlock the tool box of possibilities. Being able to evaluate the members of your team and seeing how the pieces of their personalities fit together can help you manage them to greater success. It can also assist you when it comes time to hire new team members by showing you why certain people are a better fit for the task. 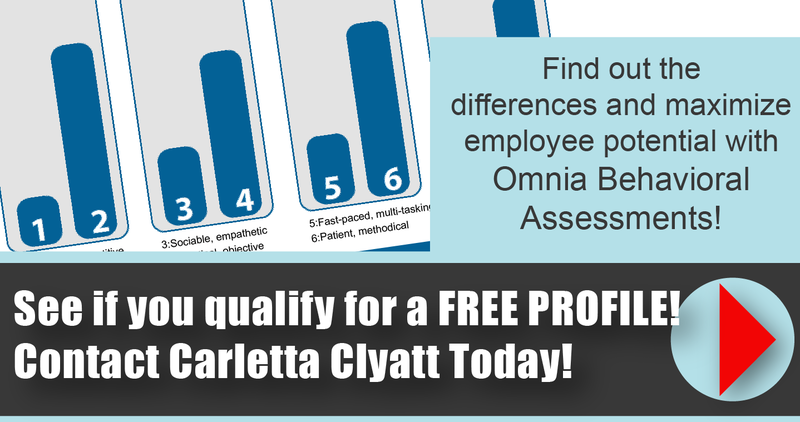 The Omnia Profile doesn’t just help identify what tools you have on hand, or those you need, it helps you figure out how to use the ones you have to maximize their potential. Perhaps, under the right circumstances, that shoe can be used as a hammer, in a pinch. There are some tools though, that if you try to use them in the wrong way, will just end up breaking. It’s true of people as well.